This is a powerful bodywork package. If you’re a bodyworker wondering why we’re offering a class about rib dysfunction, it means you really need to take a class about rib dysfunction. Since every rib is connected in the back to thoracic vertebrae, we learn that by treating the ribs not only can we address breathing difficulties but we can also realign a lot of thoracic dysfunctions. These techniques can be used together as a specialty session with your client or peppered throughout your routine. As we’ve said regarding another of our workshops, “The Essential 5”, it was a process deciding what videos we should produce first. 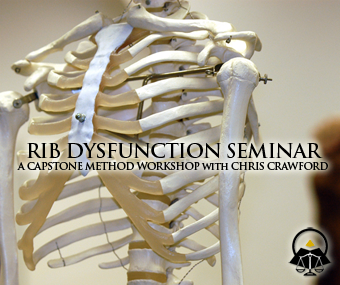 Considering the effectiveness of these techniques in our daily practices and that we use them to treat an overwhelming majority of our clients’ core issues, we made no hesitation in developing The Rib Dysfunction Workshop. This entry was posted on Wednesday, May 11th, 2011 at 8:27 pm. It is filed under Online Workshop Products, Rib Dysfunction Workshop and tagged with bodywork demos, capstone method, correct breathing dysfunction, manual therapy rib, manual therapy techniques, manual therapy videos, muscle energy techniques, online bodywork demos, rib correction, rib dysfunction, rib techniques, structural integration videos. You can follow any responses to this entry through the RSS 2.0 feed.